Unfortunately, you don’t always have access to fresh herbs. Dry herbs are great for seasoning dishes with ease, but it might be worth considering growing your own herbs indoors so you have access to fresh herbs year-round. If you’re wondering how to start an indoor herb garden, here are nine tips for herb garden success. When choosing a location for your herbs, you’ll need to find a location that offers plenty of sun exposure. Many herbs need sun for six to eight hours a day. 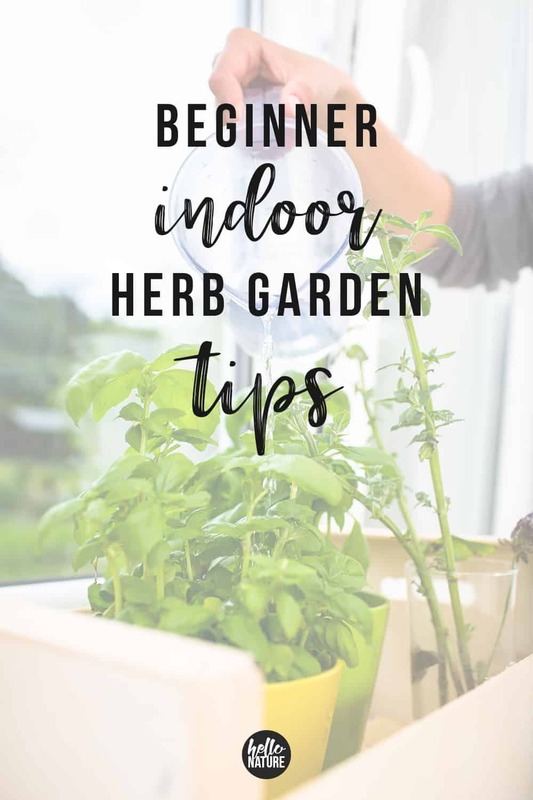 The more sunlight your herbs get, the better the flavor will be so this step is critical in deciding if you’ll be successful with an indoor herb garden. Southern-facing windows will provide the most sun exposure so these will be your best option if you’re opting for all natural sunlight. While many will choose to create a kitchen window herb garden so they can snip the herbs as they’re cooking, this isn’t a requirement. Keeping your house at the right temperature is another crucial step in creating an indoor herb garden. You’ll want to try to keep the temperature where the herbs are grown around 65F to 75F at all times. If you find that your herbs are growing too rapidly and you would like to reduce the growth of your herbs, you can lower the temperature to about 60F. While herbs don’t need a substantial amount of water each day, regular watering is necessary for herbs to thrive. Because these herbs won’t receive any water from rain, you’ll want to make sure this is a feasible task for you. Try to let the top of the soil dry out completely between waterings to prevent the soil from becoming soggy. This will help prevent root rot. You can also check the moisture level of the soil with a moisture sensor meter. Consider using this Garden Planner to keep on top of watering along with tracking issues, harvest timing, supplies you need, and more. Containers will need proper drainage to help prevent root rot as well. A small layer of rocks at the bottom will give the water a place to settle instead of the soil. Just layer the bottom with rocks and then fill with soil. Depending on the containers you choose as well as the location, you might also consider drilling holes in the bottom of them (if there aren’t holes already.) If you don’t have saucers or something underneath the container to catch the water, increase the height of the layer of the rocks. When selecting your containers, make sure that there will be plenty of room between the herbs as they grow. Good airflow between the herbs will help encourage even growth and discourage disease spreading throughout the herbs. By keeping herbs separate, you’ll set yourself up for long-term success for a few reasons. If a plant has pest issues, you’re less likely to suffer the same issues with herbs that are separated. Herbs can also benefit from different growing environments (soil ph, watering, etc) which means you can give each herb exactly what it needs to help it thrive. You can help prevent mold and increase the air circulation for your herbs just by rotating them. You can turn the plants or even swap herbs with other containers to help ensure that they all receive plenty of sunshine. If you find that your herbs are growing larger on one side than the other, this could be an easy fix. By rotating them, you’re helping promote even growth around the entire plant. If you haven’t noticed by now, indoor herb gardens can require a little more effort than outdoor ones due to differing sunlight and watering needs. Soil is no exception. When selecting the soil for your indoor herb garden, be sure to pick a potting mix that lists that it can be used in containers. You can also opt for a soilless potting mix. You also may want to consider using a fertilizer, depending on the type of soil you use as some include it in the mix. While choosing herbs you love to eat is a great place to start, keep in mind that not all herbs are easy to maintain. Basil and thyme are also great herbs to grow inside, but, they need a bit more sunlight so keep that in mind when deciding which herbs to grow. You should also consider whether you start from seed or by buying a young plant. Chives, rosemary, oregano, and thyme can be easier to grow from a young plant. Basil, chervil, mint, and cilantro are rather easy to grow from a seed. If you opt to buy young plants, always check for pests before replanting in your indoor herb garden containers. 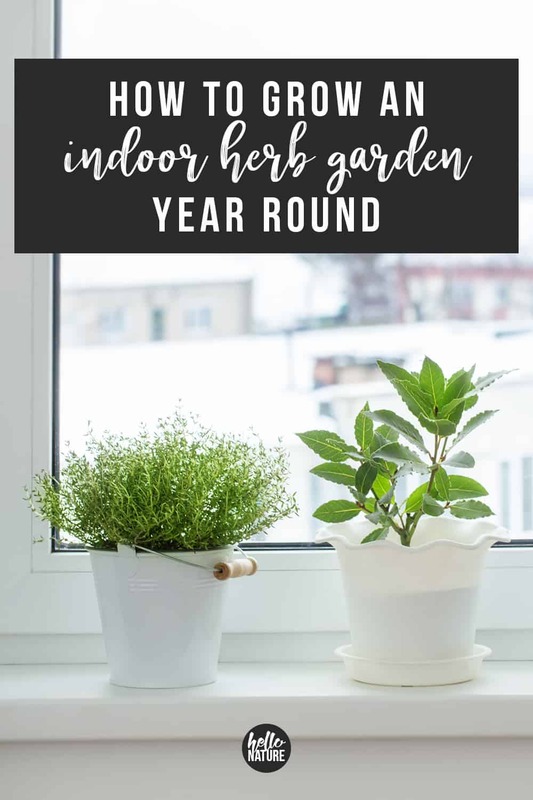 Growing an indoor herb garden may seem fairly easy after you read through all of these steps (and overall, it really is) – but you don’t want to go overboard. Select a few of your favorites, start the process, and figuring out a good system for everything. From planting to watering to pruning and more, you’ll want to master it before you dive in and have a dozen or more herbs that you’re trying to maintain. If you want to keep it manageable, you could grow a few at a time and then dry and store your fresh herbs or even freeze your fresh herbs. Does an indoor herb garden need direct sunlight? 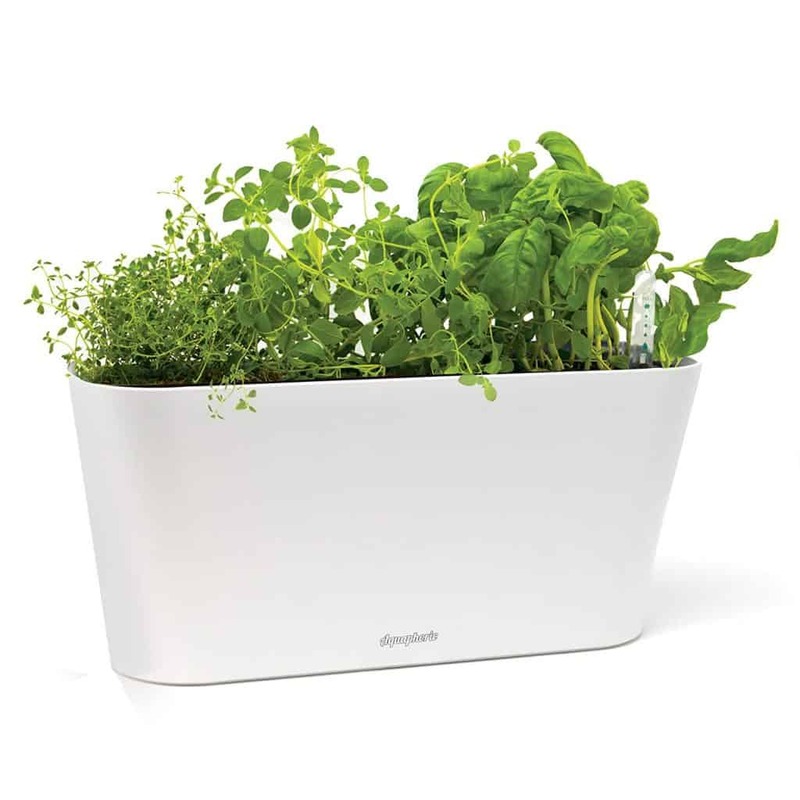 No – indoor herb gardens do not need direct sunlight. Natural sunlight can be very beneficial, but high-quality grow lights will also aid in the growth of your herbs. Regardless of the option you choose (natural or grow light), do not let this be an afterthought. Light is one of most important factors of whether or not your herb garden will thrive. When do you start an indoor herb garden? Whenever you’re ready! 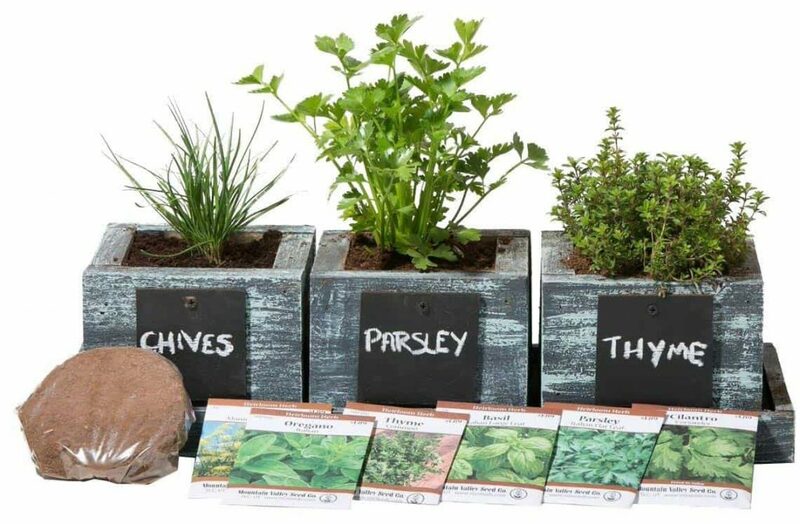 Indoor herbs garden can grow year round so there is no need to delay planting one if you have your supplies and are ready to maintain it. Where can I buy an indoor herb garden? Lacking inspiration when it comes to indoor herb garden ideas? Or maybe you’d prefer to skip the indoor garden DIYs? You can buy plenty of ready to use indoor herb garden planters or even indoor herb garden systems. I would recommend the Aerogarden. You can easily grow fresh herbs (and veggies) year-round in the garden system. There’s no soil and very little mess along with an easy-to-use control panel that includes vacation mode. You’ll also have a strong grow light to better control the light your herbs receive. In need of some inspiration for after you grow your herbs? Check out these cookbooks and herbalist guides for some tips, recipes, and more. Thanks for this great guide Ashley! Of all my years of gardening, I must admit I’ve never tried to grow my own herbs. I’m not sure why, I guess I’m just used to reaching for the dried ones we have in shakers. I’m especially glad to see that you’ve included soil in your tips. Soil is something so many people get wrong, and then wonder why their plants aren’t growing or just die. Making sure the soil enables your plants to grow well is very important! What a great post! Fresh herbs add something to food (and life) that nothing else can. The smell too….mmm, incredible. Thank you for sharing this great guide. Excellent info! Thank you so much for your comment, Holly! And yes – the smell of fresh herbs can be amazing!